Buffalo, New York. March 10, 2016 – Blue Bridge Financial, LLC, a leading national provider of small business financing, is pleased to announce the addition of Greg Brown, CPA, as Controller and Scott Rosenheck as Senior Accountant, both working at the Company Operations Center in Buffalo, New York. Bringing more than 10 years of accounting experience, Greg Brown previously held the positions of Associate Vice President and Financial Analyst with Citi, and Accountant with Rich Products Corporation. In his new role, Mr. Brown will be responsible for all oversight of Blue Bridge’s financial activities including internal and external reporting, accounting and treasury management. 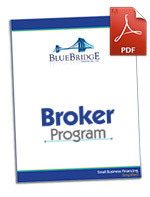 Speaking on the new opportunity, Greg said, “I am excited about joining Blue Bridge Financial, already a recognized national leader in the small business lending industry and the fastest growing company in the Western New York area. I look forward to contributing to our collective goal of positioning Blue Bridge as one of the fastest growing companies in the specialty finance industry across the United States.” Mr. Brown possesses a Bachelor of Arts in Accounting and a MBA in Finance from SUNY at Buffalo. Adding additional depth to the finance department, Blue Bridge Financial also welcomed Scott Rosenheck as Senior Accountant. With previous experience as staff accountant at HSBC, Chiampou Travis Besaw & Kershner, and Beacon Federal, Scott brings with him a collection of skills in accounting, financial analysis and auditing. Mr. Rosenheck holds both a Bachelor of Arts and an MBA in Accounting from Niagara University.